Here at Britannia Skips Ltd we know that sometimes a 4 yard skip isn’t the most appropriate one for the job. 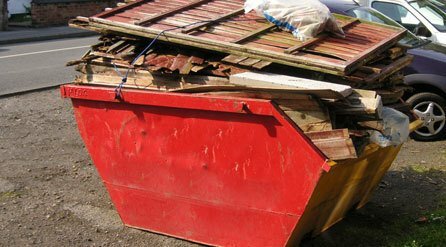 We understand that our customers need a slightly larger skip for general building work or domestic use. If that’s the case, why not ask to rent one of our 6 yard skips? The 6 yard skip is perhaps the most popular size of skip we hire out to our customers. Our 6 yard skip has a capacity of 6 cubic yards or 4.5 cubic metres – equivalent to around 60 -70 large bin bags – with dimensions of 72 x 67 x 42 inches. Our 6 yard skip is ideal for general building work and domestic use, able to handle normal materials such as earth and concrete. Our 6 yard skips can be ordered with a drop down door, allowing you to load the skip easily when you are moving materials with a wheelbarrow. We are proud here at Britannia Skips Ltd to be able to provide our customers with the ideal 6 yard skip for their application with our same day delivery service. However, we are also able to assist our customers in obtaining council permits for their skips as well as providing other expert advice. Please don’t hesitate to get in touch with us if you are unsure which particular size of skip your domestic or commercial project might require. We can discuss your individual requirements with you before deciding upon the most appropriate skip for your needs.